The Battle of the Mona Passage was a naval engagement on 19 April 1782 between a British fleet under Rear-Admiral Sir Samuel Hood, and a small French fleet. 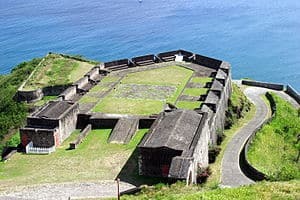 It took place in the Mona Passage, the strait separating Hispaniola and Puerto Rico, shortly after the British victory at the Battle of the Saintes. The British overtook and captured four ships, two of which were 64-gun ships of the line. 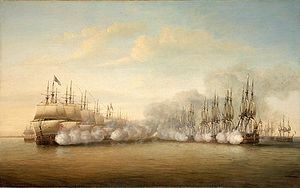 Between 9 April 1782 and 12 April 1782 a British fleet under Admiral George Brydges Rodney engaged and defeated a French fleet under the Comte de Grasse at the battle of the Saintes, thus frustrating French plans for an invasion of Jamaica. Rear-Admiral Sir Samuel Hood fought under Rodney during the battle, and was deeply critical of his commander for not pushing home his victory against the retreating enemy fleet. The British fleet made its way to Jamaica, from where Rodney ordered Hood to seek out any disabled or damaged French ships that had escaped the battle. Hood’s division of thirteen ships set out towards toward Saint-Domingue. The French 64-gun ship of the line Caton had been damaged in the initial encounter between the fleets on 9 April, and the Jason, also 64 guns, had been damaged on the 10th when it collided with the heavily-damaged Zélé. 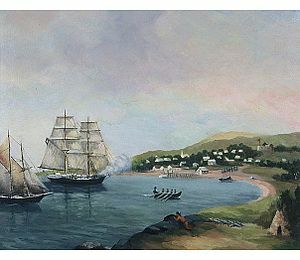 Both of these ships were in the Mona Passage, making sail for Cap-Français along with several smaller ships, when Hood’s squadron spotted them. Hood chased down the French ships, the faster copper-sheathed British ships outpacing the damaged French ships. HMS Valiant captured both Jason and Caton at the cost of four men killed and six wounded, whilst HMS Magnificent captured the frigate Aimable at the cost of four killed and eight wounded. [Note 1] The frigate Astrée however managed to escape with minimal damage. The captured French ships were taken back to England for further use. Jason was renamed HMS Argonaut, while Caton was used as a prisoner of war hospital ship and moored off Saltash in Cornwall. She continued in this role well into the Napoleonic Wars. Aimable was renamed HMS Aimable and served in the Royal Navy until 1811.